The Land Transportation Franchising and Regulatory Board (LTFRB) announced that it has approved lower taxi fare and flagdown rates nationwide. The Land Transportation Franchising and Regulatory Board (LTFRB) has approved the permanent reduction of the existing taxi fare nationwide (except Cordillera Administrative Region) to P30.00 for the flag-down rate, P3.50 for every succeeding 500 meters and P3.50 for the waiting time per 90 seconds. The lowered rates will be effective on March 19, 2016. For airport taxis, the Board ordered the permanent flag-down rate to P60.00 for the first 500 meters, P4.00 for every succeeding 500 meters after the first 500 meters, and P4.00 for the waiting time per 90 second. 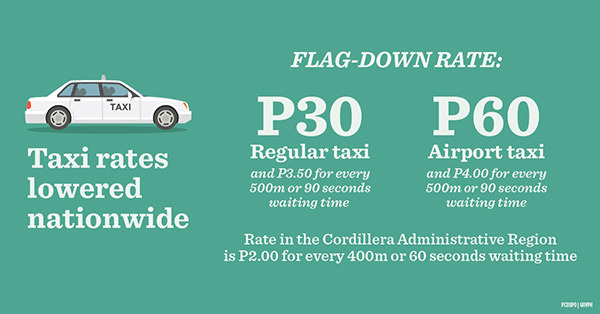 On the other hand, the permanent flag-down rate of taxis in the Baguio City will be P30.00, P2.00 for every succeeding 400 meters and P2.00 for the waiting time per 60 seconds. The reduction for flag-down rate will take effect ten days from publication of the order in national dailies, even without calibration and resealing of the taxi-meter. The Board’s decision to approve the new rates is based on recommendations from the National Economic Development Board (NEDA) and the Department of Trade and Industry (DTI). Taxi operators who fail to calibrate and seal/reseal their taxi meters on the above-mentioned schedule will be penalized P5,000.00. Taxi units not following the new approved rates will be penalized P5,000.00 pursuant to Joint Administrative Order No. 2014-01 issued by the Department of Transportation and Communications. “After carefully weighing and considering various socio-economic factors, the Board decided that the favorable effects of the steady and steep down-trend of crude prices which have a higher and direct impact to the transport sector being enjoyed by transport operators and drivers must also be passed on to the commuting public,” LTFRB chairman Winston Ginez said. The petition to revert back to the previous taxi flag-down rate was filed by the Angat Tsuper Samahan ng mga Tsuper at Operator ng Pilipinas Genuine Organization Transport Coalition (STOP & GO), Inc., while Dumper Philippines Taxi Drivers Association, Inc. filed for the cancellation of Order on the Provisional P10.00 discount of air-conditioned taxi flag down nationwide. The Philippine National Taxi Operators Association, Association of Taxi Operators in Panay Inc., and Metro Cebu Taxi Operators Association also filed a petition for the reduction of fare rate for TAXI service, UV Express Service and Airport Taxi Service. In their petitions, the transport groups claimed that the increasing price of spare parts, labor, cost of living, basic commodities and other incidental costs for the operation of taxi services must be considered in conjunction with fuel prices in the determination and adjustment of fares. Other factors the petitioners mentioned in their argument include: the high cost of living, low taxi fares, not ideal workplace, traffic congestion, sudden proliferation of Transportation Network Vehicle Service (TNVS) such as Uber and Grabcar, unreasonable traffic enforcers, discount fares for senior citizens, an unreasonable boundary imposed by operators. “In every proceeding for fare adjustment, the Board always strive to strike a balance between the respective interests of both the riding public and the operators and their drivers in order to arrive at a fair and reasonable fare,” Ginez said. According to the Department of Energy (DOE), persistent oversupply battered oil prices since middle of last year and remains the main reason behind the price slump. Gasoline prices have decreased several times and now range from P29.90 to P37.70 per liter while diesel prices have also gone down with a prevailing price of P18.15 to P21.55 per liter. The total adjustment this year stands at a net decrease of P3.28/liter for gasoline and P1.90/liter for diesel. Ginez added that the Board responds accordingly to the demands of fare adjustment whenever the prices of oil in the world market cascade to protect the interest of the people in the same manner it authorizes increase in fares whenever the price of oil soars in order to protect the investment and viability of transport operators.